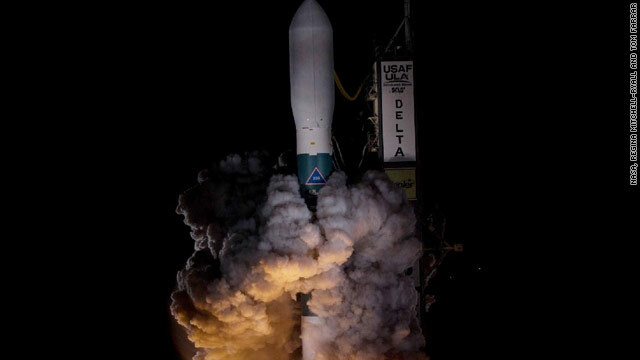 "On Launch Pad 17-B at Cape Canaveral Air Force Station in Florida, United Launch Alliance's Delta II rocket carrying NASA's Kepler spacecraft rises through the exhaust cloud created by the firing of the rocket’s engines. Liftoff was on time at 10:49 p.m. EST on March 6, 2009. Kepler is a space-borne telescope designed to search the nearby region of our galaxy for Earth-size planets orbiting in the habitable zone of stars like our sun. The habitable zone is the region around a star where temperatures permit water to be liquid on a planet's surface. The challenge for Kepler is to look at a large number of stars in order to statistically estimate the total number of Earth-size planets orbiting sun-like stars in the habitable zone. Kepler will survey more than 100,000 stars in our galaxy."